Well folks we will be out of town this Tue-next Tue. My hubby and I are visiting His family in MI. I'm looking forward to relaxing and seeing his sweet family! I know it can be hard on him to be away from all of his family so I really look forward to the times when we can get away and spend some quality time with the fam! I will be checking emails while I'm there so don't hesitate to contact me. I also want to take this time to thank all of you who left comments on my last post. And those of you who checked it out for me and sent your encouraging words I am very thankful! What a help that was! You'll be pleased to know that I did make some decisions thanks to your input. Okay now onto my current 2nd project. 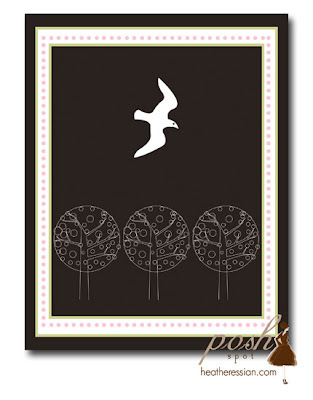 This Blog is also for my business Posh Spot fine Stationery and Invitations. I am a huge fan of thank you notes, and really notes in general. 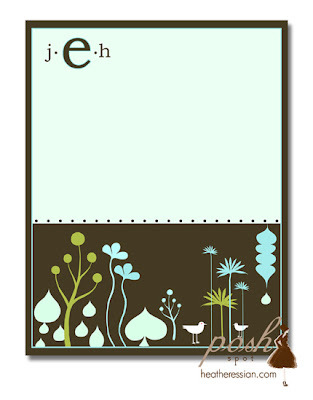 I really enjoy sending a note telling a special someone I'm thinking of them, especially if I'm loving my cute stationery! I think snail mail is way underrated these days! I designed this for a friend this weekend. When I was thinking of colors and style I thought "huh, this looks like Darcey to me." I love being able to design according to someones personality, It's so much fun for me! 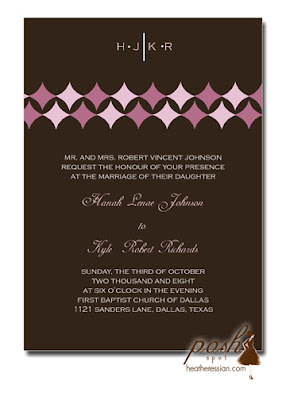 You will see an ever popular trend with me, I almost always use brown in a design of mine. I don't know what it is I'm obsessed with the color brown! This one below is a note card. You write in the space below the Monogram and then there is a space on the back to write. These are great for quick notes to your special friends and family! This is a wedding invitation. 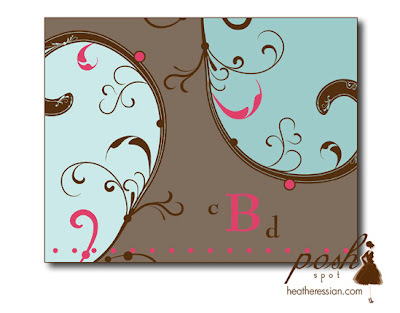 I am currently working on my Summer/Fall Line of Invitations and Stationery. I will be showing this Summer/Fall line at my Gala on May 3!